One billion mobile workers. 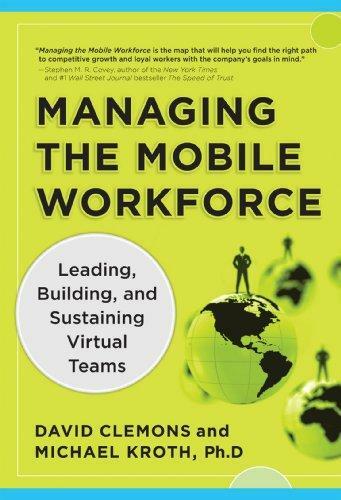 Michael Kroth and David Clemons wrote an insightful and practical book on managing the mobile workforce. It has been estimated that the worldwide mobile workforce will reach one billion this year. Overview. Topics in the book range from mobile urgency and paradigms to presence, trust, and strategy. Perspective is offered on performance management and the role of autonomy in mobile work. The book concludes with a section to technology, tools, and teams. Connectivity. From location, location, location to connectivity, connectivity, connectivity. I appreciate the perspective the authors offer on mobile workers no longer “going to work.” Mobile workers are connected to their work through a variety of mobile devices and methods. Encouragement. I encourage readers to buy this book and learn the pragmatic advice offered by the authors. Invitation. I invite readers to join Michael Kroth and I in a 45 minute free webinar conversation about the book and mobile workers on Tuesday July 19th at 10AM Eastern Time. Register. To register for this webinar, click here.